Remember that I told you I went to Little Tokyo to try Daitokyo Sakaba but it was too full that I had to change plan? Well, this was plan B! Die Stube; an old authentic German restaurant that has opened since 2004 at Business Plaza, Kemang. I probably should've posted this in October to get into the "Oktoberfest" spirit! But anyways, when we talk German food there's always gotta be pork involved, especially when I'm around! And the good news is; this place is full of pork! Another similar German restaurant is Paulaner Brauhaus, so you should get the idea of this place. When I came, the place was totally FULL, so I had to wait a bit later just to get a table. 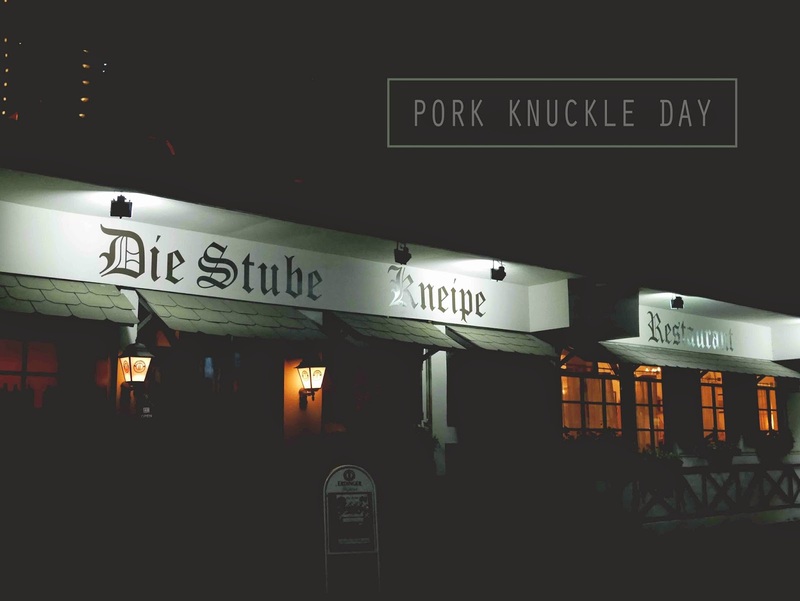 Apparently, on that day, it was 'Pork Knuckle Day', but that's not why the place was so crowded! It was because the food here tasted amazing and it's cheaper than Paulaner! It's tradition to eat meat while accompanied with beer! See how crowded the place is? You know what? Don't follow my example! You should try their signature beers or something if you dine here! You're in a German restaurant for crying out loud! I was young and stupid, I guess...lol! Just kidding, I wasn't in the mood for alcohol, so I went for lemon tea. Don't judge me! Schnitzel vom Schwein oder Haehnchen mit pommes oder Bratkartoffel, Zigeuner-oder Jaegersosse und gemischten Salat. Yes, all the name of the dish is gonna be that long! Anyone knows Germany? Teach me, please! Fyi, all the 'or's means you have to choose. For this one, I chose; breaded pork loin with roasted potatoes, mushroom sauce and mixed salad. Visual-wise; it's not tempting at all, but the taste was out of this world! Trust me! You really can't judge a book by it's cover! Basically just pork loin and bread flour. How they made it so good really blew my mind! The incredibly delicious mushroom sauce! The MVP of this dish goes to this amazing roasted potatoes! Gegrillte Rinder oder Schweinerippchen serviert mit einer deutschen BBQ Sosse und gebackenen Kartoffelecken. This was the pork ribs (of course!). Super thick yet tender pork with perfect bbq sauce! There's no other word to describe this plate than YUM! Might not look that big but it's actually really thick, so getting it that tender must've taken some crazy skill! Panniertes Kottlet mit Bratkartoffeln and gemischtem Salat. I replaced the mixed salad with spinach, since I already got the mixed salad on the breaded pork loin and I wanted to try something else! Highlight of this dish; the awesome sauce!! It might be too watery for a sauce but because of how tasty it was, that slight problem can be forgiven! I also love how they pay attention even to their side dishes here, unlike some restaurants that just give side dishes sloppily! Salute to that! The spinach was like something home-cooked by my mom, love! Still the amazing roasted potatoes! I think I just went to heaven! And by the way, Pork Knuckle Day just means everyone would celebrate it by eating pork knuckle. I wasn't one of them not because I didn't want to, but because you have to book it 3 hours before! Unbelievable! It must be super yummy! Too bad I didn't get the chance to try it!